Over the past year or two, I've rediscovered a love for comics and graphic novels. But I can't stand most super hero comics, so I usually gravitate toward the independent and underground stuff (the "weirdo section" as it is labeled at my favorite shop, Dr. Comics and Mr. Games). It must be due to all of the R. Crumb and Mad Magazine stuff I read as a kid. 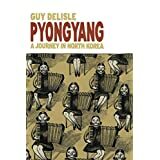 My favorite publisher at the moment is Drawn and Quarterly, who publishes the timely novel Pyongyang: A Journey in North Korea, by Guy Delisle . Pyongyang is a graphic novel of the author's time in North Korea. He was sent by a French animation company to supervise the outsourcing of animation in North Korea. His stories about being constantly monitored and having a 24-hour "handler" while there are really amazing. His drawings really capture a view of the DPRK that most westerners have never seen. And while many of the events in the novel are hilarious, you can't help but feel terribly sad for everyone who lives north of the 38th parallel. Pyongyang: A Journey in North Korea is an excellent read, especially if you are interested in current events, and Guy's art style is perfect for the storytelling.